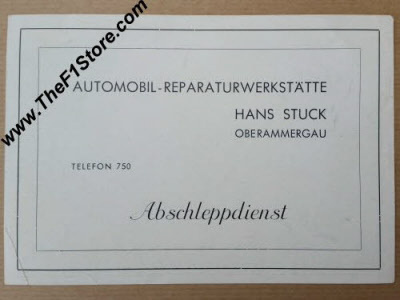 Hans Stuck Sr. advertising postcard, ca. 1945. This is a vintage, circa 1945, postcard that was used to advertise Hand Stuck's towing business in Oberammergau, deep in the Bavarian Alps and nowadays renowned as a skiing resort. 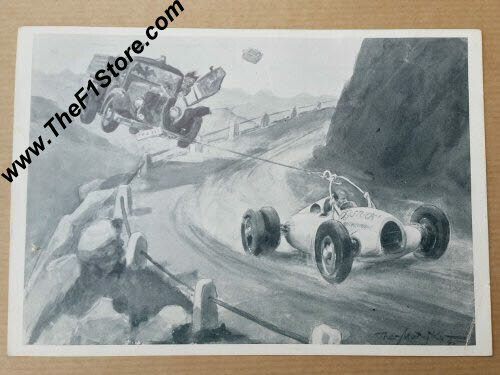 The front side shows a caricature of Hans Stuck towing a truck behind his Auto Union 16 cylinder hill climb car. The backside list contact details of his garage and towing service. Measures approximately 6 x 4 inches. A great relic from an era when even famous racing aces still hard to work hard for their money off the racing track. Vintage 1934 Hans Stuck Senior signed fan postcard. This is a vintage 1934 Auto Union C-Type fan (post)card, sent on July 24, 1934 by Hans von Stuck to a gentleman at the Stoewer car factory in Hamburg, Germany as a thank you for the congratulations that he received from that gentleman. Hans signed it in green fountain pen ink on the front but it's not the clearest signature ever as can be seen in the photos. It measures some 14 x 9 cm or 5.5 x 3.5 inches. 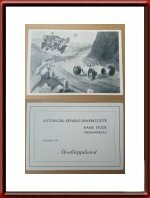 The front shows a portrait of Hans von Stuck (Father of Hans-Joachim "Strietzel" Stuck) and him behind the wheel of the Auto Union Type C (probably at the Nurburgring.